Ribbon wands are a popular choice for many couples. They come in variety of colors and make an easy DIY project for the bride who is looking to save some money. Falling leaves in various colors is a festive and eco-friendly option for couples who choose to get married in the Autumn months. This option also requires no cost and is a great way to stay in budget! Using Sparklers as a send off is a dramatic and memorable way to end a fabulous evening. Before purchasing your sparklers make sure to check with your venue because some venues don't allow them and they are illegal in some states. 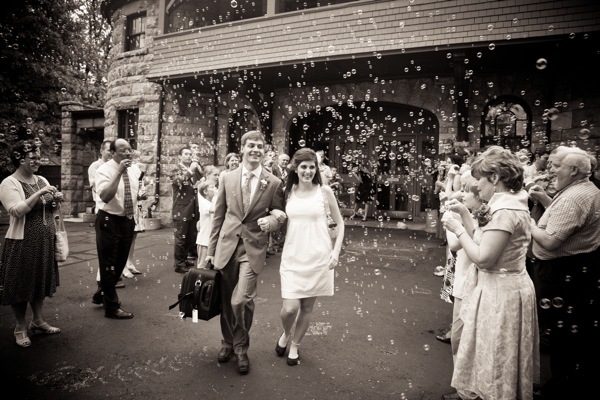 Bubbles are great option for a wedding send off. They are fun and require little to no clean up compared with the classic wedding send off of confetti. There are many options for fabulous ways to send off the bride and groom at the end of their wedding. The send off is no different from other parts of your wedding that can be personalized, so use this as an opportunity to express your style as a couple!